If you’ve ever been in a bind because you ran out of Notary certificates, or needed quick information about your state’s Notary laws, the NNA has solved those problems with two new membership benefits. NNA members can now access online notarial certificates and an electronic version of the U.S. Notary Reference Manualvia the NationalNotary.org website. You can print certificates compliant with your state’s laws — including acknowledgments, jurats, copy certifications and others. The electronic forms are accessed through My NNA Profile. Log in with your member ID and password, select “NNA Notary Resources,” click on “Certificates,” choose the state and certificate required, and then print. While you may want to keep a pad on hand of the most commonly used certificates, the online certificates become especially valuable for the forms that are seldom needed. The U.S. Notary Reference Manual provides the notarization requirements for all U.S. states and jurisdictions in one easily accessible format. The electronic version contains the same information covered in the $79.95 printed version but it will be updated in real time with the latest revisions. It also eliminates the need for members to purchase biannual printed updates in order to stay current on industry regulations. 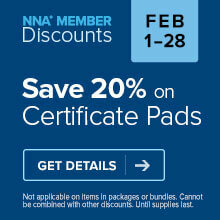 The online certificates and Notary Reference Manual options are adding value to NNA membership. Visit Become A NNA Member to learn about the many other benefits of membership in the National Notary Association. Is there an updated U.S. Notary Reference Manual after 2012 - 2013? Hello. We are no longer producing a print edition, but the online version available for NNA members is updated on an ongoing basis. I am the Deputy Recorder for the Recorder of Deeds office in Lancaster, PA. we purchased a book back in 2006 and were looking to buy a more recent version. We do not have a notary in this office. 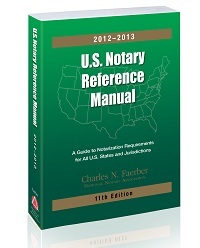 Is there any way for us to get a copy of the most recent U.S. Notary Reference Guide? Hello. We're sorry, but the US Notary Reference Manual is no longer available in print--only online to our members. However, if you can please email your contact information to publications@nationalnotary.org, we are currently working on a new information resource that may be helpful to you and can update you when it is ready. I am not a notary, but a producer of notary products. Is there a vehicle to have access to the online Notary Reference Manuel without being a notary? Hello. Access to the US Notary Reference Manual is an online benefit made available to NNA members.